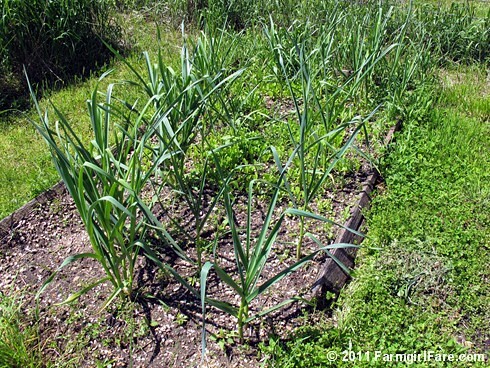 When I seeded that bed with several kinds of Asian greens in September (which did really well, though I should have thinned them more aggressively), I simply planted around the sprouted garlic. My plan was to harvest it as green garlic if the plants got big enough before the cold weather hit, but they never did, so I simply left them in the ground. Despite not being mulched or tended to, about three dozen volunteers—some of which had already grown about 8 inches high during the fall—survived winter temperatures down to —10°F just fine and began growing like crazy come spring. A few of the tips turned brown, but no real damage was done. 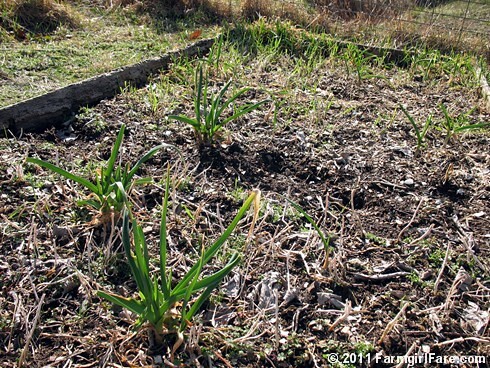 This volunteer garlic has actually done better than the pampered cloves I planted last fall (on time for once!). Where entire heads of garlic had been left whole in the ground, each individual clove sprouted, and the plants were very crowded. I figured they were growing too close together to properly mature, so I would dig those up early as green garlic. But then suddenly—as seems to happen in the spring garden—I turned around and they were already huge. 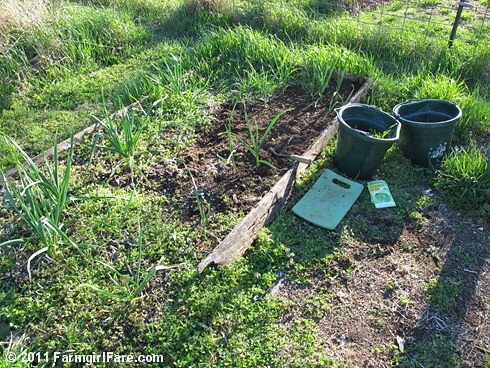 On April 5th, I weeded the garlic bed and scattered a $2.00 farm store impulse purchase packet of organic Parris Island Cos romaine lettuce seeds over about two-thirds of it. While making perfect use of this otherwise empty space, I discovered a new favorite variety of extremely heat tolerant lettuce. Ten days later, on 5/14/11. The clothespins and bamboo stakes are for shading the lettuce with an old bed sheet. Read more about shading your plants here. I didn't think whole heads would form in such close quarters, but they did. 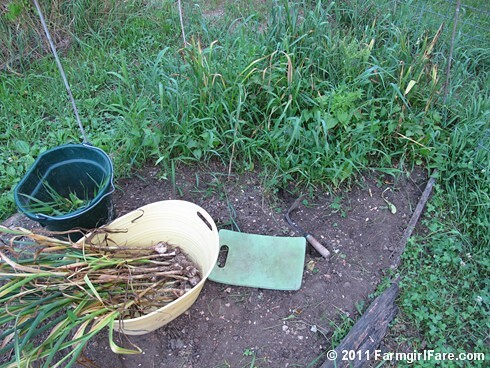 I harvested all the volunteer garlic on Saturday, June 18th, and it looks great. After 17 years, this Korean Style Hand Plow, also called an EZ Digger, is still my favorite all around gardening tool, and the only thing I use to dig up garlic. I own two because I lost one once and went immediately crazy without it, then found it a year later. I use them for everything from weeding to seeding. Lately I've had my eye on this long handled version. Bounty! Garlic for eating and planting, lots of compost-to-be (aka weeds), enough still tasty, hidden lettuce for a small salad, and more room for planting. 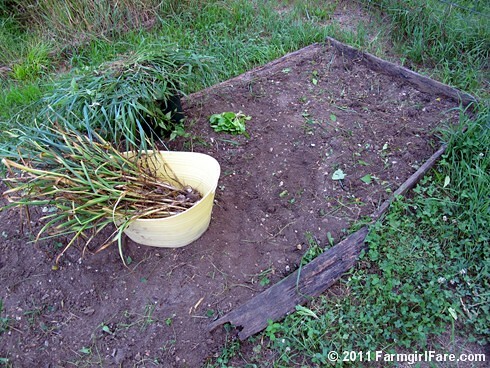 I still have a hankering for some green garlic, so I'm going to try planting some of these fresh cloves right now. I read once that you can grow green garlic in summer, and although my 2006 attempt didn't work out very well (mostly, I think, because the cloves were tucked in beds with big tomato plants and ended up too shaded), I'm ready to try again. The taste of green garlic is worth it. 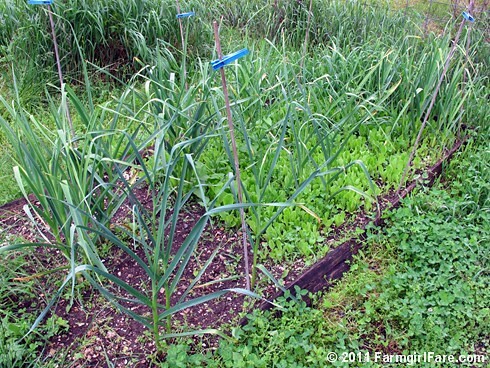 Do you ever grow green garlic? When do you usually harvest it? Any growing tips or favorite green garlic recipes? © FarmgirlFare.com, where it isn't really summer already, is it? I know that the recommendation is to not plant the smallest of bulbs, but next year, I am going to interplant them with large ones. They won't make a big head and will be excellent for thinning out and green garlic harvests throughout winter and spring. 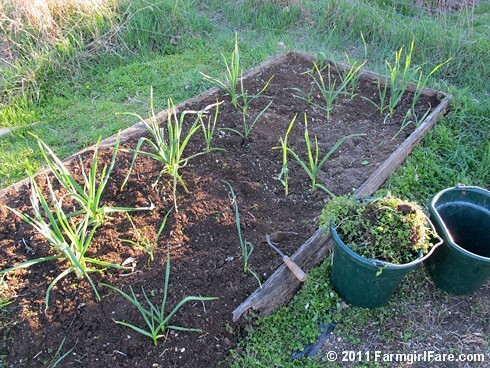 If you plant enough, you'll never have to buy store bought garlic again! I haven't used green garlic as such, but I have used the early green tops in scrambled eggs. I'm hoping to be able to dry some of the bulbs this year too - I finally figured out the softneck/hardneck difference!